Shortly before two synagogue attacks, the cancellation of a Holocaust Remembrance in Kiev, and attacks on Jews in Ukraine, US Senator John McCain stood shoulder-to-shoulder with the leader of one of the rising Neo-Nazi parties in the country. The party organizations are being accused by both Russia and external observers of exploiting the turmoil and deep divisions in Ukrainian society. The groups have pushed aside peaceful protesters, and employ violence to reach their goals. Experts on the region have criticized US funding of “democracy initiatives” which helped foster the protests, and say the Neo-Nazi thrust for power was predictable. 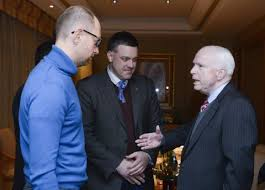 As McCain took to the stage to encourage the Ukrainian protesters with promises of American support, he was greeted and flanked by Tyahnybok, the leader of Svoboda, which recently gained 38 seats in the Ukrainian Parliament. Svoboda is one of a number of Ukrainian far-right parties, and has ties to other “nationalist” movements across Europe, which preach virulent brands of anti-Semitism, ethnic purity, intolerance of homosexuality. “After the 2010 conviction of the Nazi death camp guard John Demjanjuk for his supporting role in the death of nearly 30,000 people at the Sobibor camp, Tyahnybok rushed to Germany to declare him a hero who was “fighting for truth.” In the Ukrainian parliament, where Svoboda holds an unprecedented 37 seats, Tyahnybok’s deputy Yuriy Mykhalchyshyn is fond of quoting Joseph Goebbels — he has even founded a think tank originally called “the Joseph Goebbels Political Research Center.” Another element of Svoboda’s ideology is that Ukraine should become a nuclear power. Dr. Paul Craig Roberts says the situation has spun “out of control.” Roberts writes: “Yanukovich [the former Ukrainian president] is history, as are Washington’s “moderates.” The moderates are not only corrupt; they are stupid. The fools even disbanded the Riot Police, leaving themselves at the mercy of the armed right-wing nazi thugs. Ukraine is out of control. This is what happens when an arrogant, but stupid, Assistant Secretary of State (Victoria Nuland) plots with an equally arrogant and stupid US ambassador (Pyatt) to put their candidates in power once their coup against the elected president succeeds. “Making reference to Kerry’s threats to Russia, Dr. Roberts said:: “The puppet politicians who Washington intended to put in charge of Ukraine have lost control to organized and armed neo-Nazis, who are attacking Jews and Russians and intimidating Ukrainian politicians…The stupid Kerry, wallowing in his arrogance, hubris, and evil, issued direct threats to Russia. The Russian foreign minister dismissed Kerry’s threats as “unacceptable.” The stage is set for war.” Roberts is a Distinguished Fellow at the Cato Institute, and a Senior Research Fellow at the Hoover Institution. He is also a former editor of the Wall Street Journal and Businessweek. Nuland is heard saying “Yats is the guy,” referring to Arseniy Yatsenyuk, one of the protest leaders, now Prime minister. “What is most worrying is that the new government cannot control the infamous Right Sector. Its members are now popular heroes, the vanguard of the victorious “revolution”. They have guns captured from police departments in the western regions and now, after Yanukovych’s toppling, are demanding that the revolution needs to continue against “corrupt democracy” and liberalism. Addressing the predicament of Jews in Kiev, last month Ukrainian Rabbi Moshe Reuven Azman advised Ukraine’s Jews to leave the capital, and, if possible, the country. 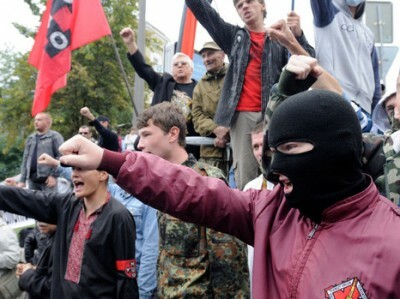 In his February 25th article, “Is the US Backing Neo-Nazis in Ukraine?” – Alternet’s Max Blumenthal reports one protester’s estimate that around 30% of the protesters, at that time, were fascists. The figure is plausible given election returns for the Neo-Nazi parties in some Ukrainian provinces, which have nudged as high as 50%. In January, Rabbi Boruch Gorin of the Federation of Jewish Communities of Russia said of the protesters in Kiev: “Unfortunately, among the opposition leaders and opposition forces, well-defined, anti-Semitic speeches have already been recorded…This is extremely dangerous.”Ukraine has a grim history of Nazi collaboration during World War II, and anti-Semitism historically. Ralph Lopez majored in Economics and Political Science at Yale University. He writes for Truth Out, Alternet, Consortium News, Op-Ed News, and other Internet media. He reported from Afghanistan in 2009 and produced a short documentary film.